Sunshine is a wonderful thing. In plants, it stimulates green chlorophyll to produce free oxygen, enabling us to breathe. Sunshine invigorates, energizes and causes the skin to produce Vitamin D, the "Sunshine Vitamin." Of course, sunshine can also give you a painful sunburn. The primary "bad factor" in sunlight is ultraviolet (UV) light. UV is the component of sunlight that causes skin dehydration, sunburn, collagen damage, DNA damage and skin cancers such as melanoma. Education about UV light, combined with a few simple skin care precautions, can significantly affect skin (and eye) health. Earth's ozone layer filters out 98% of UV rays. Of the UV radiation that gets through, 98% is Ultraviolet-A (UVA). To make sure your skin (and eyes) contain adequate moisture, drink at least eight glasses of pure water (in addition to coffee, tea, soda or juice) per day. Also, bathe often, keep your windows open when possible. 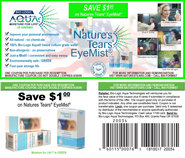 Finally, for dry skin and dry eyes, get into a daily habit of frequent facial and eye misting with Nature's Tears EyeMist or Nature's Mist Face of the Water, hand-held water therapy devices from Bio-Logic Aqua Research.